I have been flying around the past few days, and attended (amongst other things) an excellent meeting on academic integrity. It will take a few days to catch up here. My flight today, I sat next to a man who insisted on sending a million text messages during takeoff despite repeated requests by airline staff not to do so. I have no idea whether this causes real risk to other passengers, but it made me wonder what sort of person would recklessly place his fellow travellers at increased risk of any amount. The same sort of person or company who might find it easy to behave like this or like this or like this or this and still sleep well and play with their kids I suppose. "...the most devastating features of psychopathy are a callous disregard for the rights of others and a propensity for predatory and violent behaviors. Without remorse, psychopaths charm and exploit others for their own gain. They lack empathy and a sense of responsibility, and they manipulate, lie and con others with no regard for anyone's feelings." Read on: here and here. 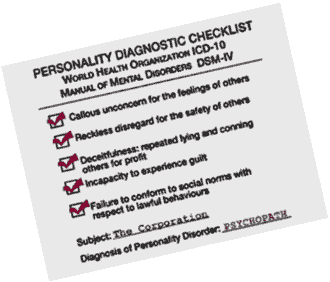 See also DSM IV criteria for psychopathy. How's this for an example? Apparently it's never occurred to shockdocs that some people actually use their brains and regard brain damage as a bad thing. Sounds like they need reconditioning. The internal processes of these acts are fascinating. There is moral work going on here, only it's got nothing to do with the moralilty of others. Or rather, any overlap is wholly coincidental. 1. The psychopath plays games with regular morality. He os she despises it and employs paramoralisms* - psuedo-moral statements which bamboozle. If you come from a position which is open-minded (i.e. you're open to persuasion) the psychopath will exploit you. 2. That doesn't mean that the psychopath is immoral, though. The psychopath has a funadamnetal morality (largely unconscious) to which he adheres like glue. This can be glimpsed when the psychopath gets genuinely outraged. *What is one to make of the case of the the ethics professor who steals ethics book from the library? His rationalisations amount to paramoralisms. Psychopaths have a deep amount of superficiallity; their appearance and behaviours are much deeper than skin deep. They have what I call a GOD complex which justifies in their minds that they can and often do do things on the basis of their own decrees. This arbitrary thought process is conscious, but lacks any form of moral or social conscience and thus feelings; such as, guilt, sorrow or empathy are not present in the genetic make-up of a Sociopath. Many Sociopaths because of genetic deficiencies or mutated genes are unaware of their abnormalities and thus their can be no conscious thought or feeling processes of their minds. They are given to uncontrolable moments of rage and when they lose control of their coping styles. Psychopaths/Sociopaths represent about 1% of the population, but in certain types of occupations; such as, Law, Police, and other areas of normally unquestioned control, power, and authority their per populace representation can be as high as 3% or greater. Unfortunately, as of this time, there is no medical treatment that can effectively deal with Psychopaths/Sociopaths. Once a person is deemed by qualified medical experts to fall into this catagory it is the responsibility to make know to the proper authorities the identity of such person or persons.